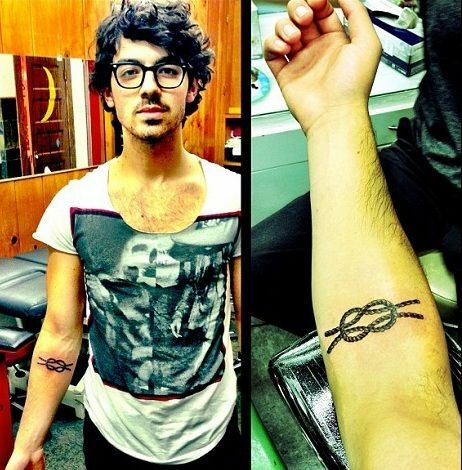 Meaning: Joe has inked his right forearm with two ropes tied two each other making an inseparable or a strong bond. The two ropes represent his Parents and four ends which represent, four Jonas brothers. In his one of the Instagram post, he captioned the pic: two ropes(parents) makes four ends (Brothers). Meaning: Joe ha got his backside of arm inked with the west African Adrinka symbol tattoo symbolizes his humanitarian works in Africa. “Help me and let me help you” is the illustration of this symbol. 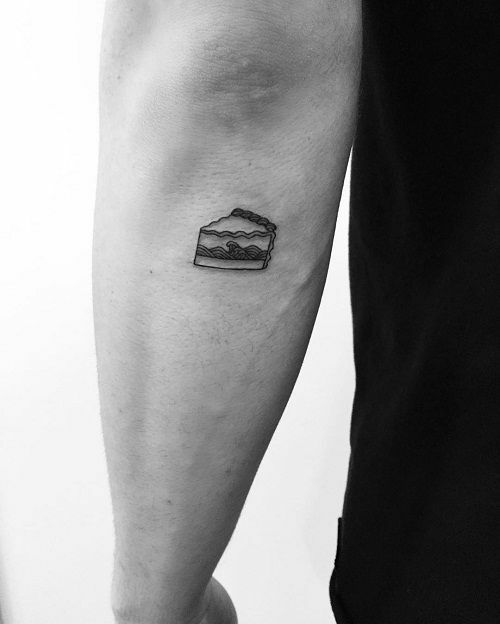 Meaning: Joe has tattooed his left forearm with a triangle and a hand inside it. In Christianity, the triangle can be used to represent the holy trinity that is the father, son and the Holy Spirit. For Christians, this tattoo can be used to show their devotion to these important deities or as a symbol of their faith. Other trinities that a triangle can represent include father, mother and child and mind, body and soul. In Greek culture, the triangle is used to mean a doorway to the pearl of the higher wisdom. Meaning: Joe has tattooed this fancy phrase circularly on his left forearm. This is the lyrics of the song The Blue Sky sung by the singer, Jeffy Ennelso. 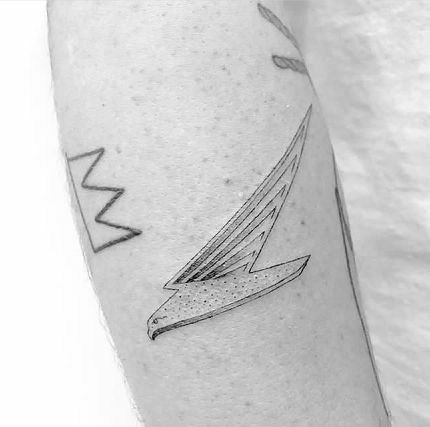 Joe got his left arm inked with a bird and three triangular flag kind of design by the Tattoo Artist, Winterstone. 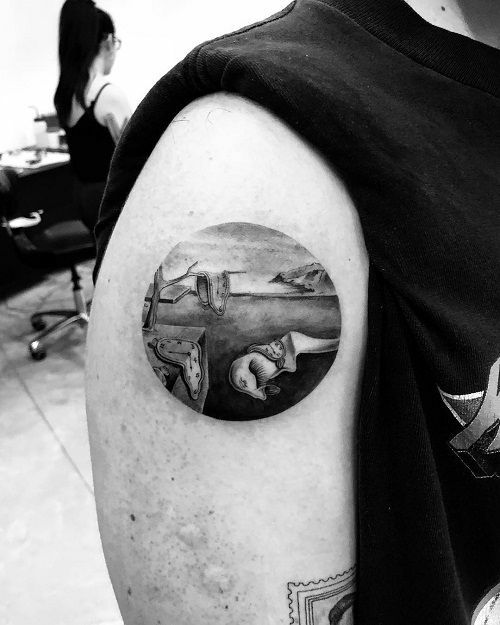 Meaning: Joe has tattooed his right upper arm with the logo of the persistence of memory by the tattoo artist, Eva. 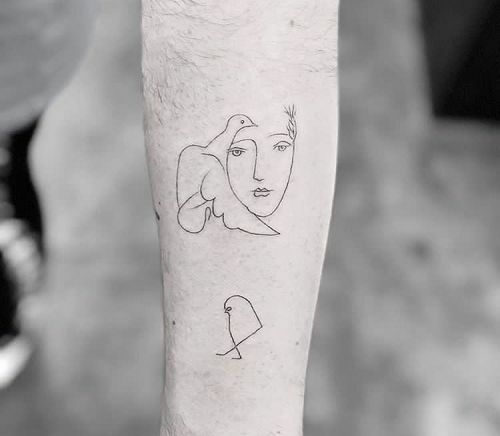 This tattoo is derived from the iconography of Salvador Dali. This painting of Dali refers to the dream he has experienced in sleep or the eye of the dreamer. In this, the melting clocks mirror for the loss of their powers along with the passing time. 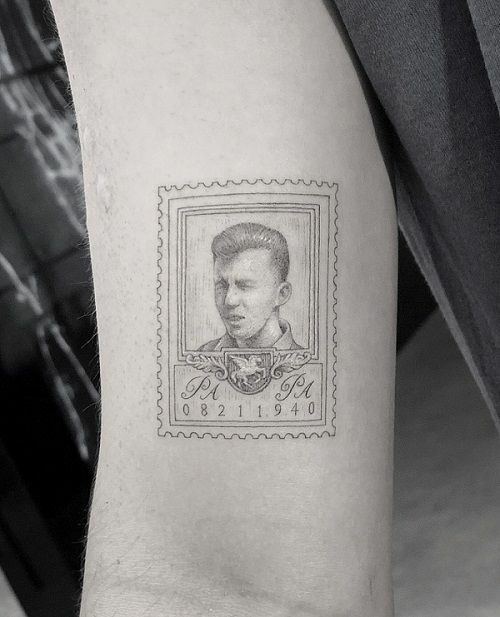 Meaning: Joe has tattoed the portrait of his grandfather on his right forearm. 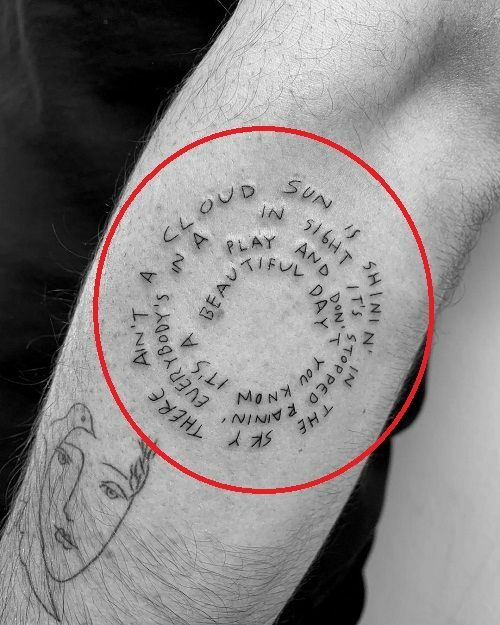 He has uploaded a picture on his Instagram account and added a caption to it as: “For Papa Miller.” This tattoo is made by Tattoo Artist, Mr. Keith in New York City. Meaning: Joe has tattooed numeral 15 on his ring finger again done by the Artist, Mr. Keith. 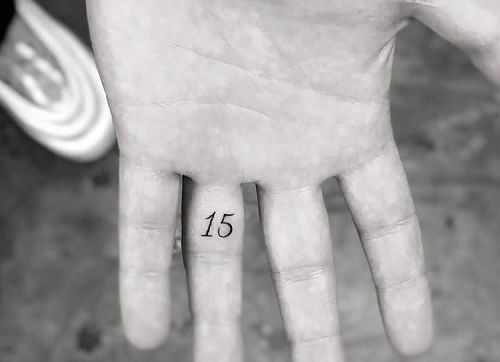 The number 15 represents his engagement date to his girlfriend, Sophie on 15 October 2017. 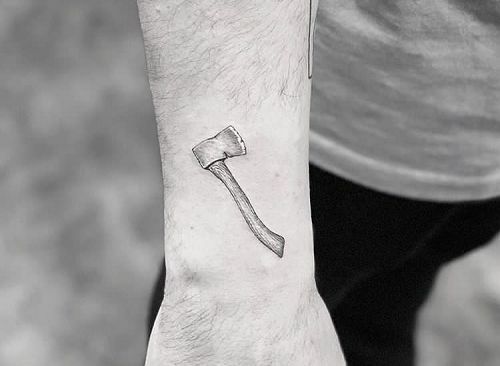 Joe has inked a figure of Axe near his left wrist which is again inked by the tattoo artist Mr. Keith. 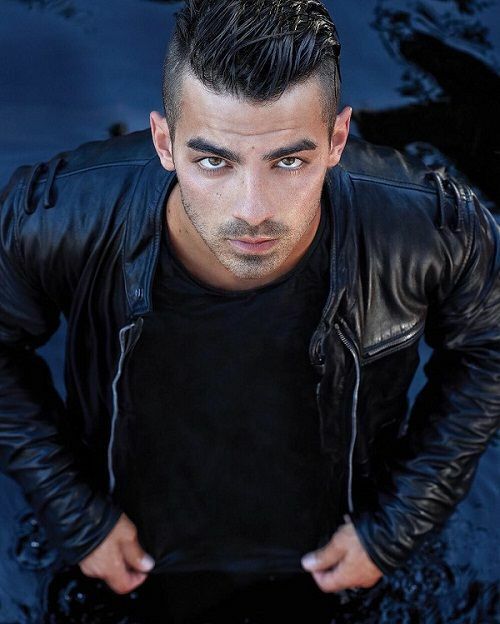 Joe Jonas has beautiful and fine tattoos inked by Tattooist Mr. Keith. 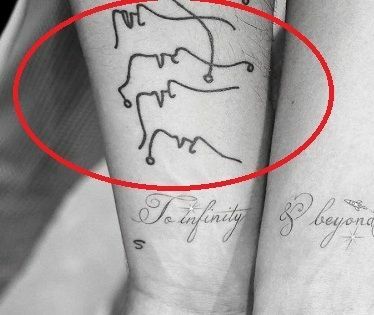 There is an outline of a bird and a lady with a bird on his left forearm. 12. “To Infinity” on his Wrist. Meaning: Joe along with his girlfriend, Sophie got inked their wrist together by the tattooist Mr. Keith. On Jonas’ wrist are the words “To infinity,” and on Turner’s wrist is “& beyond,” with a tiny, delicate spaceship. Either the lovebirds are big fans of Toy Story (the original) or they simply feel like their love is limitless. 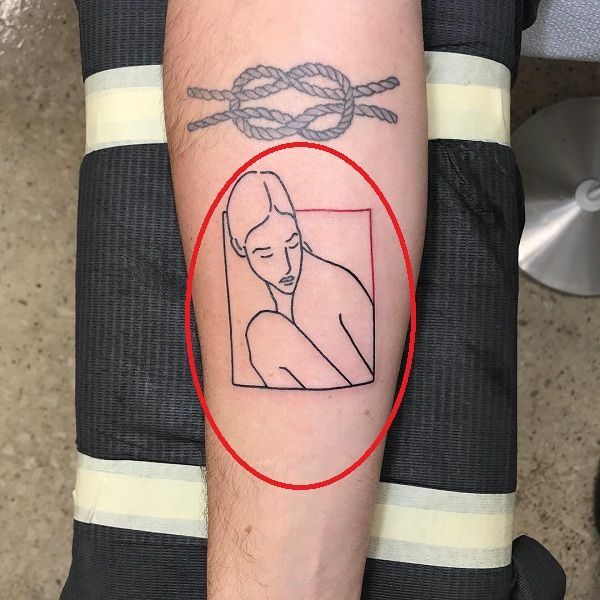 Meaning: Jonas unveiled this tattoo on Instagram, featuring a simple outline of a sitting woman who’s tilted forward with her knees pulled up under her chin. Though the outline is mostly in black, the right upper-hand corner is drawn in a rich red. It’s beautifully done, and we can’t help but notice just how similar the woman looks to his fiance Sophie Turner and, specifically, her Game of throne character, Sansa Stark. This tattoo is done by tattoo Artist, Curt Montgomery. 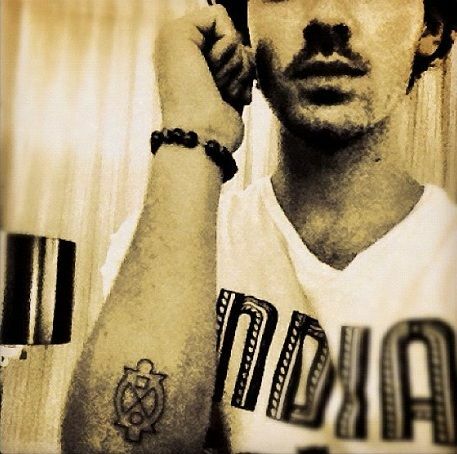 Meaning: Joe got his forearm inked with four faces which symbolize for 4 Jonas Brothers. Meaning: Joe Jonas has inked letter S on his right wrist which represents the name of his fiance, Sophie Turner.